Use as leveling screeds, or use with metal lath for laying ceramic tile. 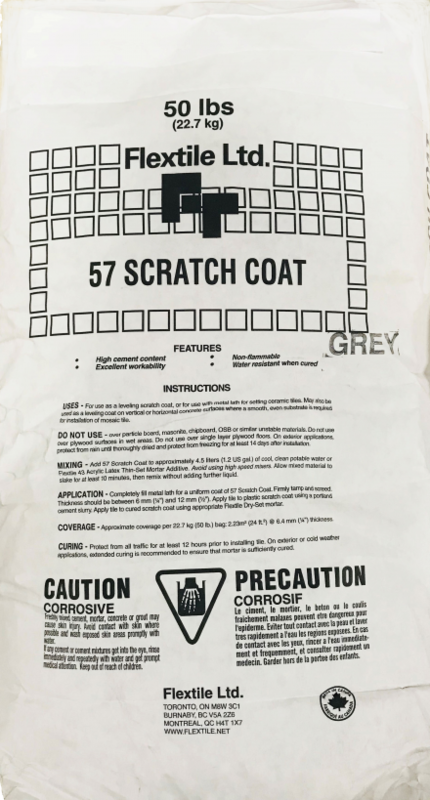 Mixed with water or Flextile’s 43 thin-layer acrylic mortar additive , Scraped Layer 57 can be used as a cementitious cement with metal lath for laying ceramic mosaics, porcelain-stoneware, or sandstone stretched over sub-floors. – Plywood floors of exterior grade or over-the-counter. Can also be used as a thin-set mortar in the plastic state or with a Flextile dry setting mix when fully cured. Can be used as a leveling screed for the installation of mosaic tiles on vertical or horizontal concrete surfaces.